Nicodemus, an exoduster settlement in northcentral Kansas, is the last survivor of the dozen all-black communities founded in the state in the years following the Civil War. Settled in 1877, Nicodemus has been the subject of numerous articles, books, and television projects and is a designated National Historic Landmark District. A dugout house two miles east of Nicodemus has also been listed on the National Register of Historic Places. 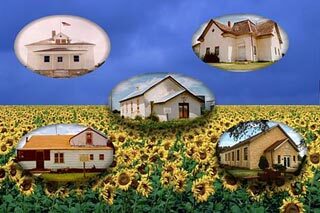 The first school and first church in Graham County were established at Nicodemus in the winter of 1877 - 78. The only remaining business is the Nicodemus Historical Society Museum, which operates sporadic hours. Although modern Nicodemus contains only approximately 20 people, it remains the oldest all black community of the western frontier. Nicodemus is extremely proud of it\'s connection with \"The Buffalo Soldiers\" and offers the following information regarding all-black participation in the military. In 1997, Turner Broadcasting System, Inc. A Time Warner Company, produced a film made for television named \"The Buffalo Soldiers\", and Nicodemus\'s very own Barry Tompkins both acted in the movie and provided technical assistance in the area of horsemanship. The town of Nicodemus is symbolic of the pioneer spirit of African-Americans who dared to leave the only region they had been familiar with to seek personal freedom and the opportunity to develop their talents and capabilities.